Specialist supplier and distributor of the highest quality preformed twinwall access chambers for use on utility and civil engineering projects. 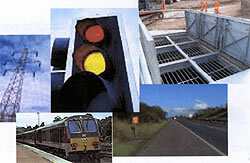 The Company also offers a full range of acces covers and chamber accessories. Preformed access chambers offer user a de-skilled, fast track construction method with a single site visit and without the need for concrete backfill. In installations carried out for BT, complete chambers were constructed from excavation to reinstatement in just over one hour. The chambers have been independently tested to the requirements of Class C250 of BS EN124: 1994 making them suitable for all non-carriageway applications including areas subject to slow moving HGV loads. The company offers two distinct chamber systems depending on application. One of the novel features of Quadbox is that box furniture items drop into ready made pockets within the chamber. This removes any requirement to cast-in fixings or to drill on site adding to the time savings available to users. Duct entries are also simple to achieve using a standard hole saw mounted on a cordless drill. The modular design of Quadbox makes it perfects for overbuilding on existing ducted networks. 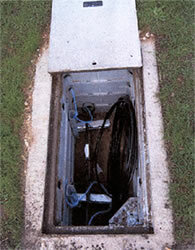 Existing cables can be managed throught he chambers walls and duct entries can be cut in any location. Chambers can also be benched to avoid existing services. BT has now approved Quadbox for use in its network; the first and only BT approved modular joint box system. For civil engineering projects where chamber sizes may cary considerably, Radbox offers a versatile range of standard structural panels and coner sections, wich offer the suer almost limitless chamber size options. The system also features flat pack delivery to site, a smooth internal wall. Due to its unique panel and coner design, Radbox is available in almost any clear opening dimension between 450mm and 4000mm and can be prepared in multi-chamber formats. Panels are available in 150mm and 500m deep sections. Manhole steps, cable bearers, brackets and other chamber furniture are easily accommodated within the Radbox design and can be factory fitted as an option. Excellent side wall stiffness. Unlike other preformed chambers available, no bracing is required during backfilling or compaction. No requirement for concrete surround - 'as dug' or type 1 backfill will be suitable. Perfect for overbuilding on existing network. No second visit to site required. Reduced signing / guarding costs. Ease of cutting duct entries etc. The use of preformed chambers significantly de-skills the installation process and eliminates the requirement for specialist box building teams. In most casaes the use of chambers eliminates the requirement for surrounds. Full installation instructions and technical backup are available from the company. Both chamber systems are available with an optional pre-fitted secondary security system which has been independently tested to category C of Loss Prevention Board Standard 1175. Dust - duct entries are cut out using a standard hole saw mounted on a cordless drill. The chamber material is inert and therefore presents no health and safety risk to operatives or to members of the public. Vibration - the elimination of any requirement for the use of core drills, pokers etc reduces the risk of vibration white finger. Lifting Weights - lightweight chamber sections typically wigh less than 20kgs offer complience with European manual handling legislation. Chemicals - the use of preformed chambers reduces the exposure to concrete and other chemicals on-site.